Beware of Rickettsia Transmitted by Tick Bites! Ticks carry pathogens for several diseases most of which cause permanent damage. Some diseases are hard to diagnose and also cause death if timely action is not taken, which might be the case since diagnosis is hard. 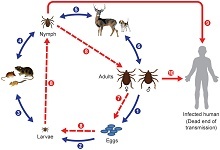 Rickettsia is the pathogen that transmits Rocky Mountain spotted fever. Apart from this disease, there are other species of Rickettsia that cause other diseases in dogs and humans. This group of pathogens is called Spotted Fever group Rickettsia. All these diseases have symptoms similar to Rocky Mountain spotted fever. In the United States of America, there are 2 more species of Rickettsia that cause spotted fever. These species are Rickettsia parkeri transmitted by the tick that is commonly called the Gulf Coast tick and Rickettsia species 364D transmitted by the tick commonly known as the Pacific Coast tick. Fever: Rickettsia is characterized by sudden high fever. Necrotic eschars: Blackened or rough patches on skin are seen in the patient suffering from Rickettsia that is not RMSP (Rocky Mountain spotted fever). However, in rare cases, even patients suffering from RMSP can find eschars on the skin. The blackening or roughening of skin occurs in the area bitten by the tick. Rash: The occurrence of rash depends on the age and other health factors of the patient. Rash occurs much earlier in children and aged than in healthy adults. In some patients the early stage rash is as severe as the later stage one. Rickettsia, the pathogen causing the disease is a bacterium. The best course of treatment is use of antibiotics. The best-known and most effective antibiotic used to treat rickettsia is doxycycline. Tetracycline also belongs to the same class as doxycycline but it achieves lesser tissue concentration than the other broad-spectrum antibiotics. However, your doctor may prescribe either doxycycline or tetracycline depending on where the infection is concentrated in your body. The later rash appears in case of rickettsia, the higher the mortality rate of the disease. If you experience sudden fever after a tick bite, see your doctor immediately for a speedier treatment. Normally, dosage for doxycycline is 100 mg every 12 hours in adults, and 2.2 mg per kilogram of body weight twice a day in children. Follow the advice of your physician in any case. Antibiotics must be consumed for at least 3 days after the fever subsides to completely get rid of the infection. Rickettsia treatment takes from 1 to 2 weeks. Maybe more in some cases based on the severity. The same measures you would take to prevent any tick borne disease would also help prevent rickettsia. Beware of tick larvae. They also cause the same diseases as ticks. Always use a tick repellent with chemicals DEET. Wear protective clothing when moving in tick-infested areas. Use light colors to be able to spot ticks quickly. Tuck your trousers or jeans into socks or wear high boots tucking your pants inside them. As much as possible, try to void tick-infested areas. If you live in a woody area, constantly (everyday) check yourself, your children and everyone else in the family for ticks. Inspect your family members and your own person after hiking in tick infested regions. Shower immediately after coming home from hikes. Wash all hiking clothes in hot water. Use tick prevention treatments for pets as approved by your vet. Keep your yard trimmed, mowed and free from debris to reduce harborage by tick infested animals. If rickettsia is diagnosed as not being RMSF, the physician must report it to the state health department as “Spotted Fever Rickettsiosis”. We hope these treatment measures and prevention tips help you keep yourself and your family safe from tick bite diseases.